The Boycott movement against Israel frequently use their material, the anti-Zionist groups on campus show their video clips on a loop and left wing political ‘Zionist’ groups like Yachad cling on to their skirt tails and refer to them as heroes. For some time, most Zionists have considered ‘Breaking the Silence’ to have crossed too many lines to be deemed legitimate. They have been accused of distortion, of deliberately exaggerating events, and of removing the all-important context from their statements. It is claimed that they receive much of their funding from groups hostile to Israel. Much of their effort seems to be directed towards an international audience. The suggestion that they were simply lying for political gain was never far from the surface. Yet as BTS accusations are invariably anonymous, how do you attack a claim that removes all identifying features from public view? Recently a group of reservists from the Israeli army, decided to do exactly that. 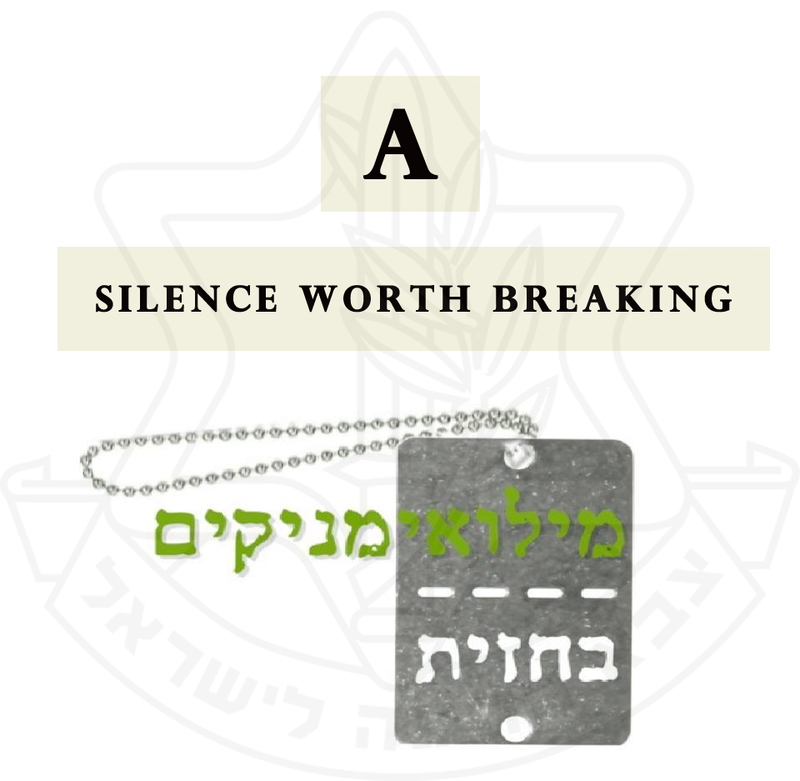 With vast experience of IDF procedure and ethics, these officers knew ‘Breaking the Silence’ were spinning lies, and by searching out those that served with publicly known members of the group, they began to piece together a real picture of the events that occurred. With BTS implying that the actions of some of these Israeli soldiers made them war criminals, this movement, ‘Reservists at the Front’, announced they had started proceedings to sue the movement Breaking the Silence for libel in the Israeli courts. Just recently, they met the Israeli Prime Minister Benyamin Netanyahu to seek support for their action. On Sunday, 17/01/15, I caught up with Amit Deri, founder of ‘Reservists at the Front’ and managed to ask him a few questions. Below is an English transcript of the interview. Shalom Amit. Thank you for agreeing to talk to me. Perhaps you can start with a general introduction. I founded and lead the group ‘Reservists at the Front’, along with another 5 Company Commanders. I left my full time position in the army 5 years ago. I served for 10 years. I have been doing reserve duty during the last 5 years in Hebron. I started the movement in response to ‘Breaking the Silence’ and today we have over 700 officers and soldiers signed up with us. In our public affairs committee, we have top ranking Army officers, Asa Kasher, the professor who compiled the IDF ethical code and so on. It is a strong group with a wide range of experience. I’d like to ask a question on the principle itself. What do you think about the idea of an independent critical group that looks at Israeli army actions? There is no problem with a group like this, the opposite in fact, we think there is a need for a group like this. We aim to become that group. There is a need for a critical look at the IDF, from movements that are external to the IDF itself and independent of it, far away from the internal checks and balances systems the IDF already employs. This is the way it should be in a democracy. The basic idea of ‘Breaking the Silence’ is absolutely legitimate. The problem comes with the mixing of two legitimate positions. The first is dealing with the ethics of the IDF. The other is the political position, the belief that Israel should not hold onto the territories. Both of these ‘flags’ are legitimate. The problem is raising both flags at the same time and bringing them together. And as soon as you raise both of these flags together, you can no longer be legitimate. Each of the positions supports the other, so you begin to support one position with the cynical exploitation of the other. So this is the line between legitimate and illegitimate, the politicization? That’s right, they (Breaking the Silence) play with both elements. They aim to get Israel out of the territories and so they use the IDF. This pressure leads to the lies, the exaggeration, the removal of context, all this of course to further a political cause. It’s important to remember, each of the aims is legitimate in itself, it is the combination under a single roof that creates the problem. Perhaps, this is a sign that some of these soldiers shouldn’t have been in the army? No, I don’t think this is the case. In my opinion, all these people are healthy and of sound mind, and fit to join combat units. There is within this group a lot of funding and again, I return to the issue of politicization. They have turned into a weapon, a weapon that is used to promote a political agenda, they are used by movements such as Boycott Divestment Sanctions (BDS), and other groups with similar political agenda’s also use them internationally. They have just become a weapon that is used against us. So they are used to provide this service? Yes, exactly, one of the NGO’s ICCO (Interchurch Organization for Development Cooperation) they fund them and instruct them to bring a specific number of testimonies from IDF soldiers. This suggests that it is not about ethics anymore, this is a market. Breaking the Silence have been operating about 11 years, what is it that has driven you to action only in the last few months? It has got more serious in the last year or so. There is a growing BDS campaign that relies on and uses much of the work of ‘Breaking the Silence’. As a group, we see them (BtS) as a blood libel, we call it ‘the most sophisticated blood libel of the 21st century’. It is designed to make it difficult to oppose, it isn’t easy to fight them. Only now we have found the people we need. People who were with them in the army, in the units, involved in the specific actions who have been able to point out the false statements. And we have footage of what they have said to people outside of Israel and the Israeli public have now woken up to what is happening. Isn’t it possible to argue that experiences within the IDF are subjective, especially when talking about army actions in or near a civilian population. That is, we can have legitimate but different opinions about what occurred. Do disagreements over what occurred at highly emotive events have to be described as lies? Firstly, we have to start by saying that having a military force operating in civilian areas is going to create problems. This is obvious and beyond argument. We believe that the IDF, amongst all the world’s armies, operates in the best and most ethical way possible. We have seen Afghanistan and we saw Iraq, the US and the British, and we have seen NATO forces in various operations. We know how to operate in the most ethical and moral way that is possible. Are there problems? Of course there are, and these specific cases are open for subjective interpretation by everyone involved. But there is that and then there is suggesting the IDF shoot at innocent civilians just for fun. That isn’t a witness reporting, that is someone just inventing stories. If this were true, these extreme accusations, then they army itself would co-operate with them, and want these events checked. I personally know soldiers who have faced internal IDF investigations to explain their actions. There isn’t a problem with subjective opinion, there is a problem with them taking these stories and making them anonymous. After catching them lying several times, you can no longer believe them and again the ultimate purpose of these statements is for political use on the international stage. They release everything they do in English and groups like the BDS feed of them. You are right, there are people that interpret events in different ways, and yes, that is also okay, but the main problem with BtS is that they take this subjective interpretation and advertise it as IDF policy. They turn it into the official position of the army. They turn it into the will of the officers, the actual orders received, systemic operational policy. That is the main problem with them. Every small issue that can happen, turns into operational policy. I saw one of their clips, when the soldier says he was told to fire at buildings randomly. Okay, first off, we are lacking context. This is a war, and in a war, you fire, you shoot, you attack. And then of this clip, you ask when, where, what were the conditions. On what were they firing? And then, the event you are describing, it was a closed area and there were no people meant to be there. The entire neighbourhood has been cleared of civilians. That fire was in response to fire against us. In that event, there was not a single casualty. It is also really old footage. I think it dates back to about 2001 near Hebron and it was following the murder of the baby Shalhevet Pass. The Jewish people in Hebron were under daily fire. But there isn’t much you can do, it is a war and in a war you return fire. But if the accusation was that we were shooting at innocent civilians or without reason, then no, absolutely not. And they take these accusations outside to the international community? Yes, without context. And not just Europeans, also in Israel, if you remove the context, it is difficult to understand the reason. They believe the event happened, they believed the soldiers were shooting like madmen, how do you correct this misconception. The damage is done. I understand you are taking court action against Breaking the Silence for libel. Can you expand on this? We believe our chances for success are good. We are taking action with soldiers who were with these people in their military units, who know those claims to be false. We want to bring them out into the open, into a court hearing, to the point they need to bring the evidence, who said, how was it said, where was it said, in what context, what happened, who filmed, finally, they will need to come away from the anonymous accusations and prove what it is they are saying. They say they diligently check all of the statements. It’s simply not true, that’s the problem. I will give you the example of Avner Gverayahu who talks about his team, ‘Breaking the Silence’ didn’t approach anyone from the team, so how are they checking. We found people from his unit and interviewed them. We put together the result of these interviews in some of our public reports. I understand, Ud Kan, the group behind the ‘Ezra Nawi’ expose also had a person in ‘Breaking the Silence’. The group recently found him and claimed it was a result of his evidence not being strong enough, is this true? No, they found him because after the show, they realised there were also plants within their movement and so they began to do a thorough check. They have enough money to do what they like, but this guy was inside for 18 months, and a few moments before Illana Dayan was meant to air a second show on the issue of the extreme left wing activism, they found him. We think someone involved in the media may have given him up. You met with Benyamin Netanyahu, the Prime Minister, how did that go? He was very supportive, he said he would help us if he could. He understood we are clearly dealing with a movement that spreads lies and works to delegitimise Israel and the IDF for political reasons. And do you get financial support from Israel? No, not at all. We are volunteers. That is the point. We support ourselves We do not want financial support from the State, because then we also turn into a political instrument. You are an Israeli group, operating inside Israel and in Hebrew. Much of the delegitimisation campaign of ‘Breaking the Silence’ takes place in English and on the international stage. Even left wing self-declared Zionist groups like Yachad and J-Street openly support a movement that you believe is spreading lies about Israel. All of this of course works into the hands of the BDS movement. What would you say is the way pro-Israeli supporters can defend against this type of delegitimisation? I would say that individuals, not just groups, follow the events closely. Unlike the other side, there is no money to translate everything, so take the Hebrew videos, the Hebrew posters and translate them. Get the message out that they are being lied to, that BtS is part of a well-funded political movement to delegitimise Israel and the IDF. Turn up at events where the lies are spreading and show them the truth. Anywhere where ‘Breaking the Silence’ are being allowed to distort the truth and delegitimise Israel. Talk to anyone who can help us spread our message to the international audience. If anyone sees people from this movement spreading this disinformation, record the event, get the evidence to us. We are in a battle, and we are fighting on two fronts. We are aiming to act as a real, independent alternative to ‘Breaking the Silence’, working to improve the IDF, and we are aiming to expose their distortions and their lies. Our advantage is that we are all senior soldiers, heads of units, all of us are of the rank Major or above. We all have the real experience to be able to address the issues that can occur and because of the choice BtS have made, we will need to do this on this international stage. Amit, wishing you all the best and thank you so much for your time. Reservists at the Front can be contacted via their Facebook page. Next Oz Torah: Ask the Rabbi “Do animals know about God? great initiative. Wishing them (and us all) success.